SediGraph III Plus real-time display allows to monitor the analysis for any immediate procedural decision as demanded. The C4G have just acquired a grain-size analyser micromeritics SediGraph. This cutting-edge equipment keeps being the worldwide industry standard for particle size analysis, which size distribution is measured by applying sedimentation. 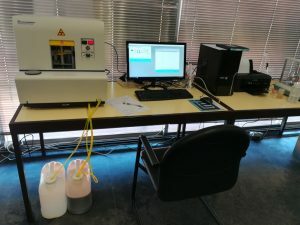 According to Professor Fernando Joaquim Fernandes Tavares Rocha, from Geosciences Department at Aveiro University, SediGraph determines the equivalent spherical diameter of particles ranging from 300 to 0.1μm. “The mass of the particles is measured by X-Ray absorption straight forward by measuring the velocity of the falling particles through a liquid with known properties as described by Stokes Law”, explains Professor Fernando Rocha. This new equipment has its operation fully automatic by increasing the sample throughput. By allowing various analysis speeds, it gives the researchers a choice of a desired speed combination and resolution. Furthermore, the real-time display allows to monitor the analysis for any immediate procedural decision as demanded. As Rui Fernandes, president for the C4G Coordinating Council and Executive Council, states: “SediGraph III Plus is a cutting-edge acquisition assuring us, C4G, an excellence status as a research infrastructure of FCT’s Strategic Roadmap”. Accuracy – This new generation of SediGraph III Plus combines this proven technique and the cutting-edge technology to provide reproducible and highly accurate particle size information, completing most analyses in minutes. It also offers advanced instrumentation and resource that assure that the measurement can be reproducible and easy execution. Besides, temperature-controlled analyses ensure that liquid properties remain constant throughout the analysis so that accurate results can be assured. Multidisciplinary – The possibility of introducing data from other methods of particles sizing allows an excellent application in various field of knowledge such as geology, chemistry, cosmetic, ceramic. This entry was posted in Equipments and tagged accuracy, C4G, ceramic, chemistry, cosmetic, geology, multidisciplinary, particle sizing, real-time display, SediGraph III Plus, Stokes Law. Bookmark the permalink.